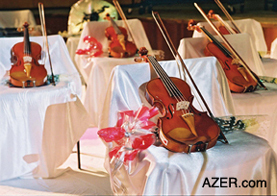 (6) "Philharmonic Reopens: Renovation of Baku's Prestigious Concert Hall," by Abid Sharifov, Deputy Prime Minister. (AI 12.2, Summer 2004). Above: Cellist and conductor Mstislav Rostropovich celebrated his 75th birthday in his city of birth, Baku, this past March. Here he receives a gift of flowers from a young dance troupe. Photo: Khalid Asgarov, REUTERS. 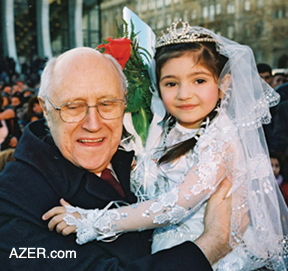 Each year since his 70th birthday in 1997, world-renowned cellist and conductor Mstislav Rostropovich (March 27, 1927-April 27, 2007) has been visiting his native city of Baku to conduct Master Classes. This year, on the occasion of his 75th birthday, Rostropovich brought the people of Azerbaijan a tremendous gift: a grant of $1.1 million from The Vaccine Fund to immunize Azerbaijani children against Hepatitis B and other threatening diseases. And from the government of Japan and the Yamaha Foundation, he brought musical instruments for the Azerbaijan State Symphony Orchestra. In turn, Azerbaijan's birthday present to the Maestro was the nation's highest honor, the Order of Independence, from President Heydar Aliyev. Photo Above: Khalid Asgarov, REUTERS. The Vaccine Fund is a non-profit organization that works to ensure that every child, everywhere, has equal access to life-saving vaccines. As a member of The Vaccine Fund's board of directors, Rostropovich acted as the Fund's representative to Azerbaijan to help deliver the $1.1 million grant, which will allow Azerbaijan to include hepatitis B vaccine in its regular infant immunization program. The Hepatitis B virus, which led to 900,000 deaths around the world in 2001, causes an inflammation of the liver that can lead to a chronic illness and eventually death from liver cancer or cirrhosis. Although anyone is susceptible to hepatitis B, infants and children are at greatest risk. Ninety percent of infants infected during the first year of life become chronic carriers of the virus, and one out of four children who becomes a chronic carrier eventually dies from cirrhosis or liver cancer. In Azerbaijan, where an estimated 4 to 7 percent of the general population is infected with Hepatitis B, the disease is considered endemic. Azerbaijan's Health Ministry has set a target of 80 percent hepatitis B vaccine coverage for newborns by 2002 (87,576 infants) and 90 percent coverage by 2004 (100,504 infants). Immunization services in Azerbaijan were seriously disrupted following the collapse of the Soviet Union but have improved considerably in recent years. Left: An audience of students and teachers looks on as Rostropovich provides instruction during his Master's Class at the Music Academy. A celebrated cellist, he is also famous for accompanying his wife, opera singer Galina Vishnevskaya, on piano. Photo: Khalid Asgarov, REUTERS. 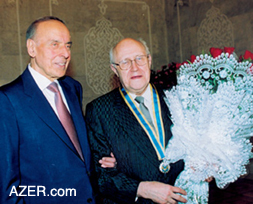 Right: President Aliyev presents Rostropovich with Azerbaijan's highest honor, the Order of Independence. Photo: Rafig Baguirov. It was an emotional homecoming for the Maestro, who conducted a gala concert of the Baku Symphony. "It fills me with joy to be able to bring the gift of health to the children of Azerbaijan, and the gift of music to the entire nation," said Maestro Rostropovich. 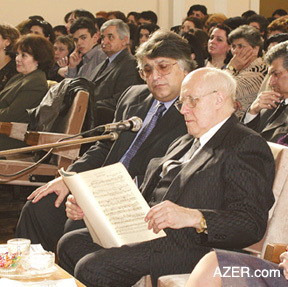 Left: Rostropovich examines a musical score during the student concert as Music Academy Rector Farhad Badalbeyli looks on. Photo: Elman Gurbanov. "President Heydar Aliyev and the people of Azerbaijan do me great honor. This is a wonderful way to celebrate my birthday." The Maestro, who now lives in Paris, was born in Baku. At the age of four, his parents moved to Russia, where he continued his music education. At 16, he entered the Moscow Conservatory and studied composition under Prokofiev and Shostakovich. At 18, in 1945, he won the gold medal of the First Soviet Competition for Young Musicians. He went on to earn both the Lenin and Stalin Prizes, which were the Soviet Union's highest honors. In 1956, he made his debut at Carnegie Hall in the U.S. and began his conducting career in the Soviet Union in 1961. He and his wife, the famous Bolshoi soprano Galina Vishnevskaya, ran into trouble with Soviet authorities for his associations with dissident writer Alexander Solzhenitsyn, for housing him in their dacha and for writing an internationally publicized letter attacking the Soviet regime. In retaliation, the government curtailed their concerts. Left: Minister of Health Ali Insanov, Rostropovich, President Aliyev, Galina Vishnevskaya (Rostropovich's wife) and translator Tahir Karimov look on as a newborn is vaccinated. Rostropovich brought a $1.1 million grant to provide vaccines for infants. Photo: Khalid Asgarov, REUTERS. In 1976, Rostropovich defected to the United States and the following year, was appointed Music Director of the National Symphony Orchestra in Washington, D.C., a position he held for 17 seasons until 1990, when he returned to the USSR during Gorbachev's Perestroika. 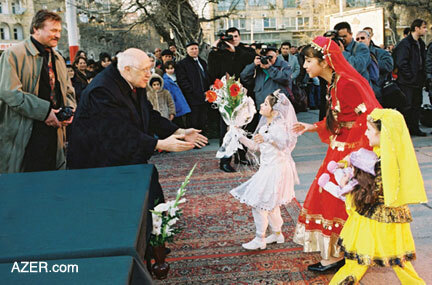 Rostropovich returned to celebrate his 70th birthday in Baku and Moscow in 1997. After realizing the enormous musical talent that exists in Azerbaijan, he promised to return annually to give Master Classes. Again this year he has organized these sessions in which some of the best students from the major music schools from elementary to the conservatory are selected to perform for him in the Bolshoi Hall in the Academy of Music in the presence of about 250 students, parents and teachers. 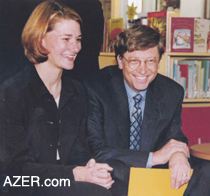 Left: Bill and Melinda Gates initiated The Vaccine Fund with a $750 million donation. Right: The government of Japan and the Yamaha Foundation provided new instruments to the Azerbaijan State Symphony Orchestra, which were presented by Rostropovich on the occasion of his 75th birthday. Photo: Khalid Asgarov, REUTERS. 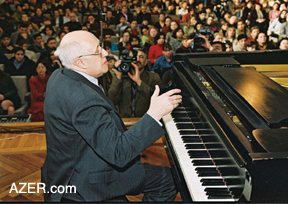 Rostropovich is recognized internationally as a consummate musician and an outspoken defender of human rights. Widely considered to be the world's greatest cellist, he enjoys special relationships as conductor with such widely varied orchestras as the London Symphony Orchestra, the New Japan Philharmonic in Tokyo and the Vienna Philharmonic. As a pianist, Maestro Rostropovich has often accompanied his wife, who joined him on this trip to Baku, as she often does. 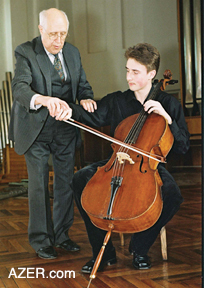 Left: Rostropovich critiques Music Academy student Aleksei Maltikh's cello technique during an annual Master's Class held in Baku March 2002. Photo: Khalid Asgarov, REUTERS. Rostropovich holds more than 40 honorary degrees, and 25 different nations have lavished more than 90 major awards upon him, including Knight Commander of the Most Excellent Order of the British Empire, Gold Medal of the Royal Philharmonic Society of London (1970), Commander of the Legion of Honor of France, membership in the Academy of Arts of the French Institute, often called the "Forty Immortals," the Japan Art Association's Praemium Imperiale, and, from the United States, the Presidential Medal of Freedom and the Kennedy Center Honors of 1992. To learn more about Mstislav Rostropovich, see "Mstislav Rostropovich: Cellist and Conductor" in AI 7.4 (Winter 1999), available on AZER.com, or visit www.rostropovich.org.